Cell division is the fundamental process by which a parent cell makes two daughter cells identical to each other and to the original cell. The eukaryotic cell cycle consists of two stages. During the long interphase the chromosomes are replicated. They are then distributed between the two daughter cells during the mitotic phase and cytokinesis. When they do not divide cells are in a quiescence state in the G0 phase. Cells are stimulated to enter the cell cycle by mitogenic signals. The cell cycle has four phases: G1 (Gap1), S, G2 (Gap2) and M. G1 is the preparation phase for DNA replication that occurs in the S phase. G2 is the preparation phase for mitosis. When cells stop proliferating they exit the cell cycle and become quiescent. At the end of the G1 phase cells pass through the restriction (R) point, a point of no return at which they are irreversibly committed to prepare for DNA replication and they no longer require mitogenic signals to complete the cell cycle. The four phases are coordinated and the proper progression through the cell cycle requires a phase must not begin until the previous phase is successfully completed and that the transition between two successive phases is irreversible. Complex cellular surveillance mechanisms act at several points in the cell cycle and trigger an arrest when an abnormality is detected. Illustration for an upcoming textbook on the cell cycle and its main players. Created in Adobe Illustrator CC. a) The transient assembly of cyclin/CDK complexes due to the short life span of cyclins. b) Reversible phosphorylations by other kinases and dephosphorylations by phosphatases. c) The transient association with CDK inhibitor proteins (CKI). d) Changes in intracellular location of cyclins and cyclin/CDK complexes. e) The rapid turnover of cyclins by the ubiquitin-proteasome system. f) The timed cyclin gene transcription. The restriction point (R) is a point of no return at the end of the G1 phase at which cells are irreversibly committed to divide. It is controlled by the Rb-E2F pathway. Rb family proteins are tumor suppressors that arrest the cell cycle in the early G1 phase by interacting with and sequestering the transcription activator E2F thus preventing the heterodimeric E2F/DP transcription factor complex to bind to the promoters of genes involved in the G1/S transition and in DNA replication. HDAC recruited by Rb also participate in E2F inhibition by compacting the chromatin and making it inaccessible. During G1 Rb is gradually functionally inactivated by phosphorylation by CDKs and releases E2F which activates the transcription of its target genes at the G1/S transition in particular cyclin A that triggers the onset of the following S phase in a complex with CDK2 and participates to maintain Rb phosphorylated during the S phase. Rb is first phosphorylated by CDK4 and CDK6 which inhibits Rb binding to HDAC and decreases Rb binding to E2F. Another step of phosphorylation by Cyclin E/CDK2 is required to hyperphosphorylate Rb, inactive it as a transcription repressor and fully dissociate the Rb/E2F complex. 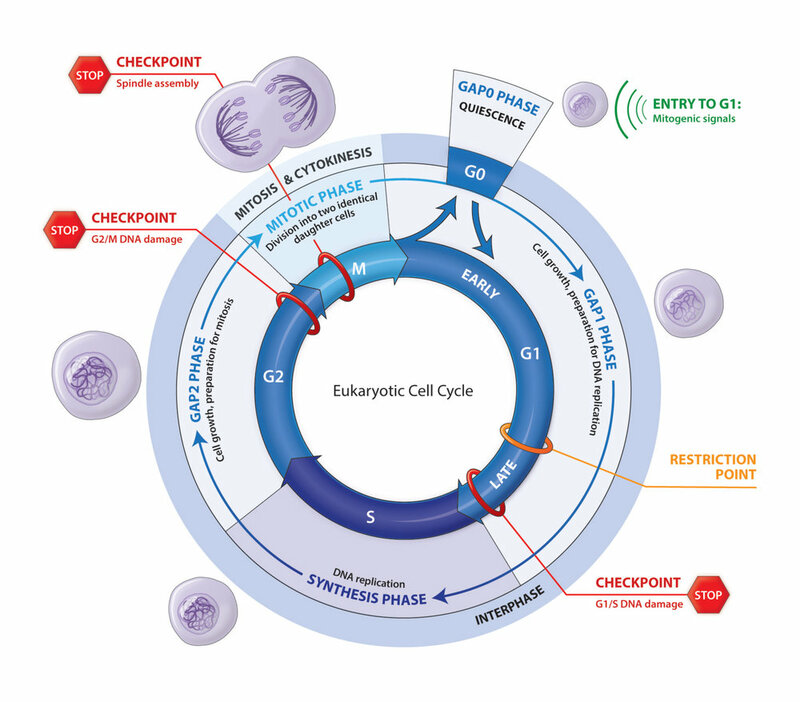 Cyclin E transcription sustains Rb hyperphosphorylation through a positive feedback loop that contributes to the irreversibility of the G1/S transition and to the no longer requirement of mitogenic signals to complete the cell cycle. The timed inactivation of Rb at G1/S depends on the timed activation of CDK4/6 and CDK2 through their association with their respective cyclins - induced following mitogenic stimulation and the activation of PI3K/Akt and MAPK pathways and Myc-mediated transcription - and their phosphorylation/dephosphorylation by CAK and CDC25. In early G1, Rb is in an active underphosphorylated form, its phosphorylation by cyclin C/CDK3 having promoted the G0/G1 transition. The cyclin D/CDK4/6 and the cyclin E/CDK2 complexes are inactive due to the inhibitory action of respectively INK4 (and the continuous degradation of the uncomplexed cyclin D) and Cip/Kip families of CDK inhibitor proteins (CKI). During G1 a small level of p21 and p27 CKIs stabilizes the cyclin D/CDK4/6 complex and p27 is phosphorylated by cyclin E/CDK2 and degraded by proteasome-mediated proteolysis. At the beginning of the S phase, cyclin D and cyclin E are rapidly degraded through the ubiquitin-proteasome system. 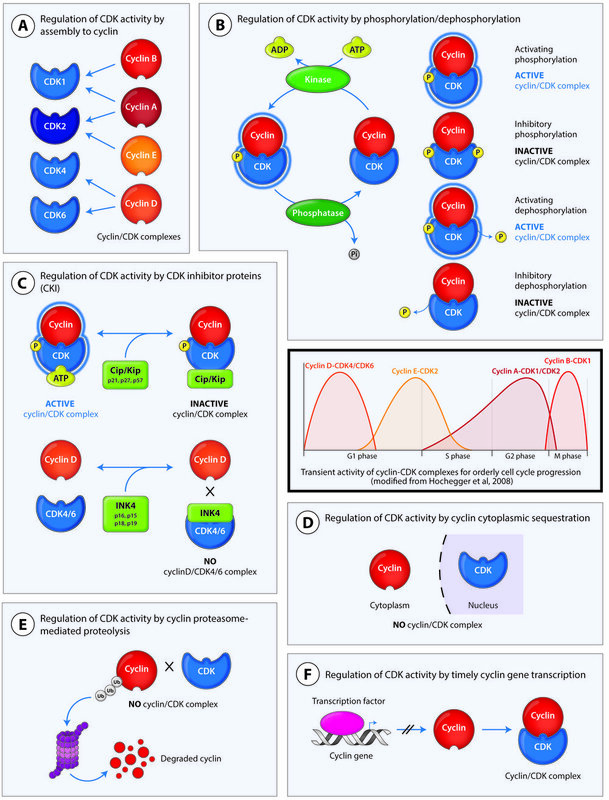 Cyclin D is known to be a target of GSK-3β kinase that facilitates the redistribution of cyclin D from the nucleus to the cytoplasma by enhancing its association with CRM1 nuclear exportin. Palbociclib, Ribociclib and Abemaciclib are selective inhibitors for CDK4/6 (Table I) that were developed to prevent cancer cells to pass the restriction point through the inhibition of Rb phosphorylation and the consecutive repressed expression of E2F target genes.